a website designed to be interesting, fun, rich in information content, with an earthy tone and relaxing design. 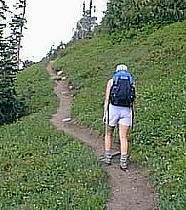 Here, you can purchase the hiking equipment you need for camping and hiking and also find information on how to select, use and care for your hiking gear. In addition to hiking equipment, we present a hiking guide in the form of hiking tips, general hiking information, hiking philosophy & practice, and hiking gear lists and checklists. Our Hiking KIDS section is particularly useful to parents who would like to take their children into the backcountry, providing both the hiking gear and the hiking help necessary for a safe, memorable, family backcountry adventure. Aquilegia formosa of the Buttercup family (a.k.a. Red Columbine, Western Columbine, Sitka Columbine). The Crimson Columbine is a common and attractive wildflower native to western North America, from Alaska to Baja California and eastward to Montana and Wyoming. The flowers can be seen from April to August (with some variation between regions) and are about 5 cm long and red and yellow in color. 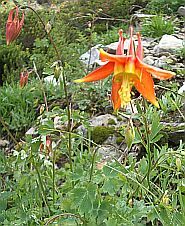 Within its range, the Crimson Columbine can be found in most kinds of habitat. However, it is not found on desert floors, nor at altitudes above 3300 metres, and it is absent from the Central Valley of California. It prefers moist locations such as stream banks. - Wilderness Medicine, Beyond First Aid : by William Forgey; Paperback. - Get Your Kids Hiking: How to Start Them Young and Keep it Fun!